A couple of months ago, I was searching for songs about the body--specifically how the heart and lungs work--for my first graders, who were learning about the body in their unit of inquiry. 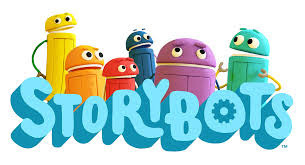 I came across some really great videos by something called Storybots...and I haven't stopped watching them yet. It turns out the Storybots have a huge arsenal of videos about a lot of subjects--a song for each letter of the alphabet, songs about transportation (which is what my first graders are learning about now), classic kids songs sung in robot voices. You'd think they'd be super-annoying, but...they're not. I love them just as much as my kids do. And my kids el-oh-vee-ee LOVE them. In a big way. Even the fourth and fifth graders. Turns out the Storybots also have a series of hip-hop style songs about dinosaurs, and the solar system. I've found that not only are they fun and educational (the fifth graders are actually learning about the solar system right now, so they've seen the five solar system songs), they're also a great bargaining chip when the kids are getting silly during VAPA time. "Oh, hey," I'll say, "I was hoping we'd have a few minutes at the end to watch some Storybots, but we're wasting time." Today, a colleague who was covering for a fourth grade teacher came in at the end of that class' VAPA time to find me collecting the paintings they had made while the kids sat, engrossed by "I'm So Hot" (the sun's song). I could hear chuckles coming from her. "This is adorable!!" she stage-whispered to me as I packed up my belongings. "You have no idea!" I whispered back. "They have a song for everything!" And they really do--but what I love most is that they resonate across grade levels. My kinders can learn about emotions, while the fourth and fifth graders can rap along (and they already know most of the words) to the solar system and dinosaur songs. I'm growing rather fond of these sweet little robots. Friday was a rough day. See, I love my job, and it's a really good place to be, but that doesn't mean there won't be days where I want to throw my hands in the air, scream, and run out of there. Friday happened to be one of those days. I'll live. By the time we started our afternoon faculty meeting, I was ready to escape for my weekend...but meetings must be attended. Fortunately, I work at a school where all meetings are started with Good Things (people share something good that is happening) and where fun activities are sometimes thrown into the mix to keep us awake and building relationships among ourselves. On Friday, we threw paper airplanes. Each of us made a simple airplane, and wrote two facts about ourselves on it. And then, 25 teachers ran around the room, throwing paper airplanes, picking them up off the ground, throwing again, for a bout five minutes. It was a circus, and all of us were laughing with pure exhilaration. Even teachers need to play, you know. I lost 90 pounds from February 2009 to September 2012. The teacher who had my airplane guessed me on his first try--he knew I'd lived in England--but very few people knew the second fact. I got a lot of "Oh, wow!" and admiring head nods. But the best part was those few moments of uninhibited play time. We needed that, and I don't think we really knew that we did. I love working at a school that recognizes this, and recognizes our need for Good Things, and Affirmations. Teaching is hard work--the planning, the grading, the worrying, the wrangling. Rough days happen, and Friday morning was certainly rough for me. It was good to get a chance to just play. As Sac Choral goes into its twentieth season, I enter my fifth with it, and my first year in this group having a full-time job again. The adjustment has been tough--instead of having some nice at-home time before I leave, I stay at school, go to the gym, and find something to eat for dinner (usually Starbucks or Jamba Juice). It makes for a long day. When you factor in the weird sciatic thing I sometimes deal with and long periods of standing, by 9:00, I'm staring at the clock, willing it to speed its way to 9:30 so I can drive home (45 minutes) and get to bed by 11:00, hopefully. The last couple of months, I've almost started resenting this long day, wondering if it's worth it to be so tired on Tuesday, to spend so much time away from home on Monday that Mom and I joke on Sunday nights, "See ya Tuesday!" Lately, it hasn't really felt like it is, and I've contemplated leaving the group. Last night was our first concert of the season. A year ago, I missed this fall concert, due to pink eye and a small panic attack on Friday, but this year, I was able to go. I had a rough day on Friday, and found myself on Saturday morning, sighing as I trudged up onto the stage at the church where we would be singing. "Why do I have to be here for two-and-a-half hours? I have laundry to finish. I need to go by the grocery store. Food prep. Chores. And then I have to come back tonight." I decided an attitude adjustment was in order. No one is forcing me to sing with Sac Choral--this is something I choose to do, and that means I choose to go to the less-convenient rehearsal times. I choose to attend something that is 45 minutes by car from where I live. I have no cause to complain, because no one is forcing me to be part of it. So, why don't I quit? Believe me, sometimes it's tempting to think about having my Monday evenings back, but last night, as I sang through John Rutter's timeless and beautiful Requiem under Don's baton, I had one of those musical epiphanies I have every once in a while. What a privilege it is, I thought, to have the ability to sing. To have the opportunity to be in a group such as this, and to sing great choral literature with a director who demands great accuracy and beauty, but never beats it out of us. Everyone can sing. Yes, everyone. But not everyone can sing at the level required to sing in Sac Choral, where reading skills and ear training are probably even more important than how "nice" your voice is. And even as I shifted uncomfortably in my "witch dress," (as Dad likes to refer to it), and even as my lower back started to protest at all this standing about, last night, at one particularly gooey and pleasing soprano line, as Don gazed over at us with a look of utmost fondness on his face, I thought to myself, "I don't want to quit this." I took fewer pictures this week. Not for any real reason. I beat my previous best by TWELVE minutes. That's huge. I walked a lot less towards the end. Getting stronger! Mom bought some mini roses. not to daydream about my London trip too much!! Some Starbuck's time before choir rehearsal. I make excellent curried chicken. on my first night in London. Also red (post timed-mile run). My colleague made spanikopita and it was amazing. finished and snapped a quick picture. Someone didn't quite get the right idea. minutes, then read the facts and had to guess who it was about. Morning Sac Choral rehearsal at Fremont Presbyterian Church. Glasses, no red lippie. That comes later. Our fearless leader, Don Kendrick. Understandably, I had London on my mind this week--which was a busy week, as usual. Then, yesterday, it was all about the City By the Bay. Sunday in the Gym With Matt. A rose bush in honor of Millie. Can you spot the (enormous) tomato worm? Monday morning in the library. LONDON LONDON LONDON LONDON LONDON!!!" A treat from the Russian teacher. I donated a basket for a fundraiser. Dutch song about duckies for my 2nd graders. in a parking lot--way back in December. The first items from my Donors Choose project arrived. He's rolling in his grave. So did my school pics. Girl Scouts behind me. They're cute, but they're noisy. Fortunately, I have ear buds...and Keane. The industrial part of the North Bay. Lovejoy's, the tea place, has this little shop across the street. and food. We love it. The scone was melt-in-your-mouth incredible. I loved this blue building near where we parked. We drove through the Castro and I took some pics from the car. We ended up at the de Young Museum for Free Admission Day. There were a lot of performances going on. Ten dollar candles (the size of a votive) in the gift shop. Can, can you do the can-can? Can you? Can you can-can? Outside, in the park, the serious business of fall was going on. Two awesome ladies in Golden Gate Park. Back at the Emeryville station, waiting for my train home. I walked up to the top of a pedestrian bridge while I waited. The light was really lovely.